This year I was lucky enough to celebrate Christmas in one of my favourite cities: Prague. It is a beautiful city in any season, but at Christmas it is simply wonderful! Whether you enjoy the hustle and bustle of the festive market in Old Town Square, an evening stroll along the river, where the lit up castle twinkles on the skyline or if you like to escape the cold and have a hot drink in one of the many cafés and tea rooms; Prague has something for everyone. I lived in Prague for eight months in 2008 and one thing that I loved to do, was to grab a book and find a comfortable place to sit while disappearing in its pages. In the summer, I would usually make my way to a park or a café with a garden, and in more chilly weather, I could sit for hours in many of Prague’s lovely tea rooms. There is one place in particular which combines my hobbies very well, and I always make sure to visit when I am in town. The Globe is an English Language bookshop, with a café/restaurant at the back. 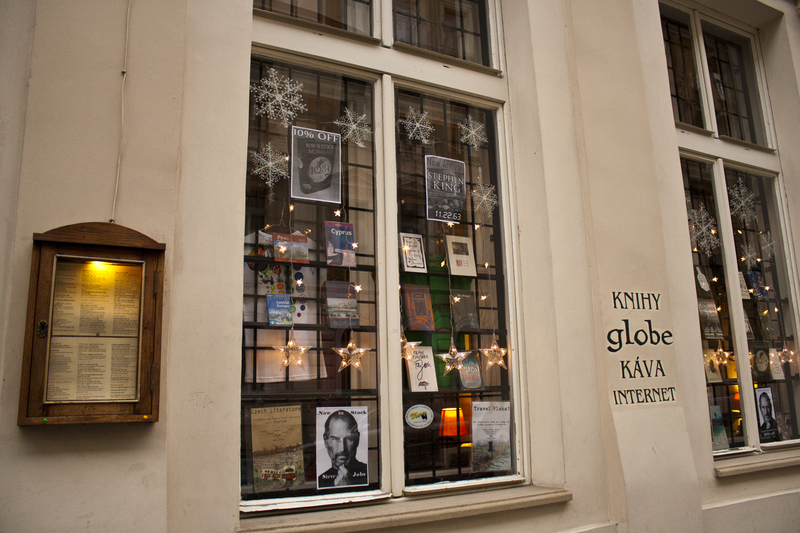 As an English reader in Prague, The Globe was the perfect place to hang out. 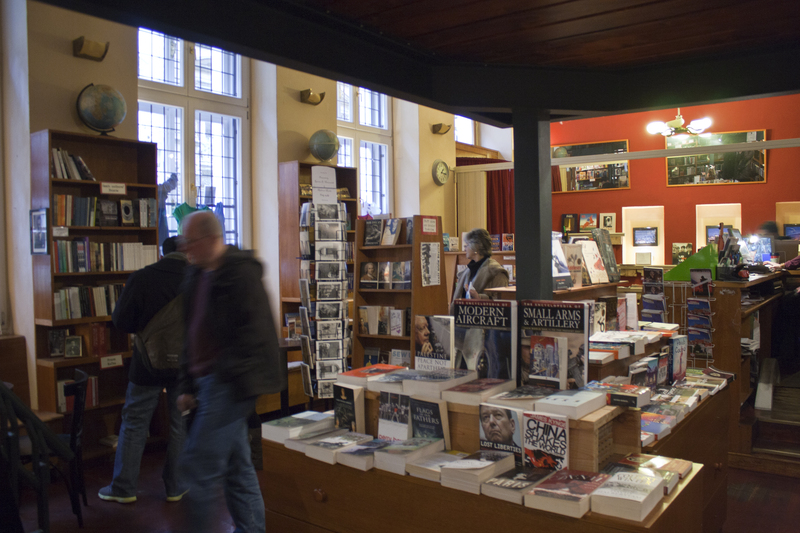 The space is used effectively, with a staircase leading to a mezzanine floor filled with mostly non-fiction books on politics, self help and philosophy. There are also some plants (as you can see in the blurry photos – sorry), which brings a nice living room like atmosphere to the place. Downstairs there is a lot to offer; Mostly fiction books, of all sorts of genres. There are many old classics, new titles and a section dedicated to Czech literature and Prague. 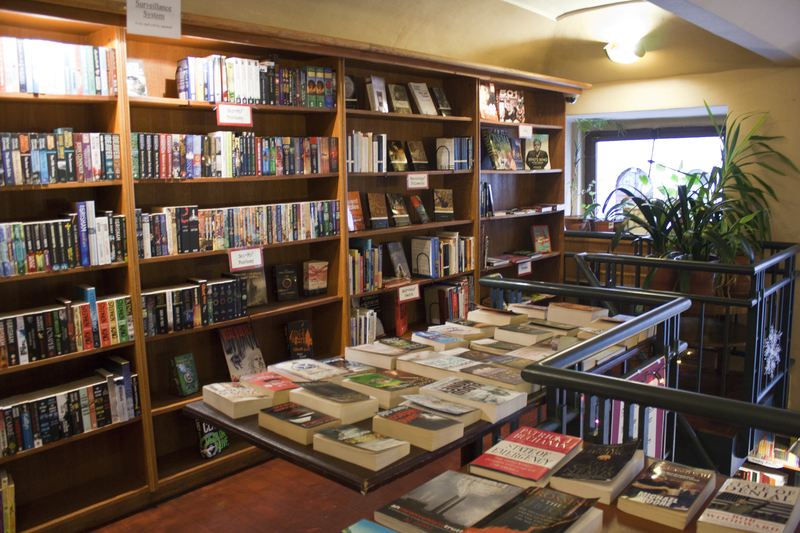 The shop is clean, tidy and pleasant to walk around and browse the shelves. As is usually the case in foreign language bookshops, the prices are very expensive. However, there are second hand books on offer too, so if you keep your eyes open, you may be able to find something a little more affordable. Browsing through books can be thirsty work, so if you have time, you should really pop through to the next room to the café where you will not be disappointed. The walls are painted red and the lighting gives off a cosy glow. Again, there is no space wasted, as there is another mezzanine floor – which is my favourite place to sit. But now, let’s talk about the food. I have fond memories of coming to The Globe for brunch with my brother. It was always seen as a treat, because compared to almost everywhere else, this place is very expensive. There used to be a great breakfast / brunch menu, with everything you could want, from a Full English to an American style breakfast, or simply yummy looking cakes to have with a coffee. After looking on their website, it looks as though this is only available at the weekends. 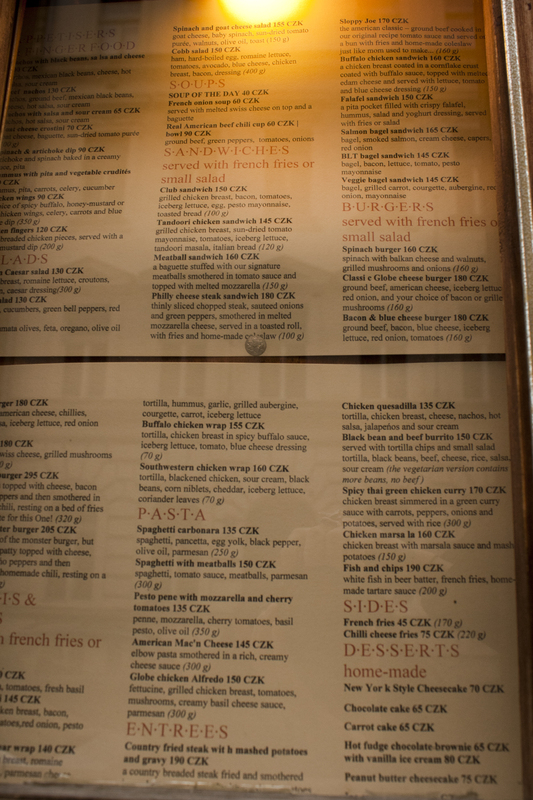 The weekday menu consisted mostly of burgers, pasta, salads and sandwiches. I must admit, I was a bit upset that I couldn’t have my favourite Full English, but I had been told that the burgers were delicious. And so they were! Well, if you are already liking the sound of The Globe, you’ve not heard it all yet! It’s also a great place for ex pats to meet and mingle among like-minded people. If you are bored one evening, take a look at their events listings. 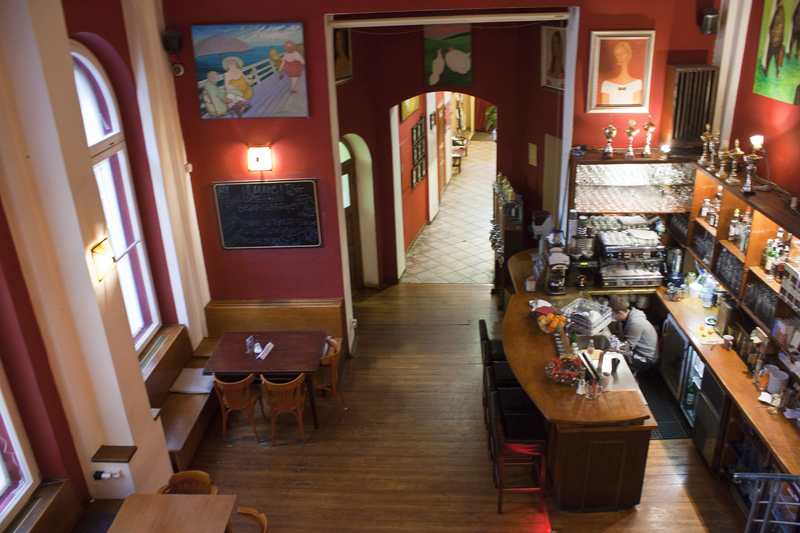 They have everything from film screenings, live music and book clubs. I wish I’d had more courage when living in Prague to participate more in things like this, I imagine it would have been a fun way to meet new people over a cocktail or two! On this particular visit, I didn’t buy a book, not so much because of the prices, but because I had only booked carry on luggage on my flight home (which was already taken over with books that I had received for Christmas!) But that did not stop me enjoying my burger and a teapot of English Breakfast tea afterwards. My brother bought a C.J.Samson book that he had wanted for a while, the rest of my family and I were happy pointing out good books to each other and looking through the local Czech literature that was displayed. As you can see, this bookshop / café is not to be missed! Good books, great food, superb location… What more could you ask for? To find out more about The Globe, visit their website (where you will find some less blurry photos, information on the artwork in the café and upcoming events). The Globe is very central; only a few minutes away from the National Theatre and easily reached by public transport. 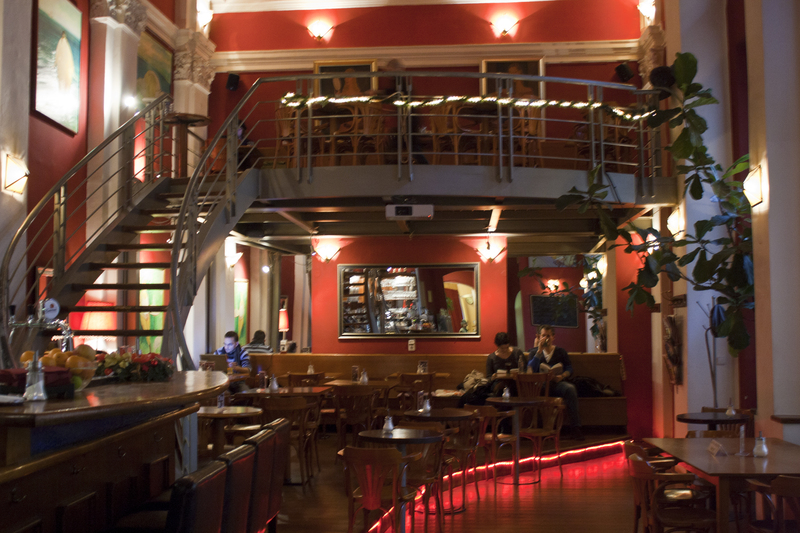 The address is: Pštrossova 6, Praha 1, 110 00, Czech Republic. (phone: +420 224934203). Visited The Globe when in Prague a few years ago. Really loved the shop and the city. Would be great to go back again!! It’s a great city and there are more great bookshops there too. I’ll have to visit a few of them next time I go – didn’t have enough time on my last visit! I can’t wait to visit Prague. Looks like you enjoyed it! Yes, I always love Prague! You should definitely go! I was in Prague in summer of 2007, and everyone in my group loved The Globe. Good food, cheap Internet access (we were a long way from home), and so many books! I’d love to go back there someday, and would move there right now if someone offered it. Prague is a wonderful city to live in! I always wish I could go back…maybe one day! Oooh that looks amazing! I’ll have to try and find it when I get a chance to go to Paris. Good Luck with getting over to Prague! Looks brilliant, thank you for the recommendation! Will definitely check it out when in Prague (fingers crossed soon! ).